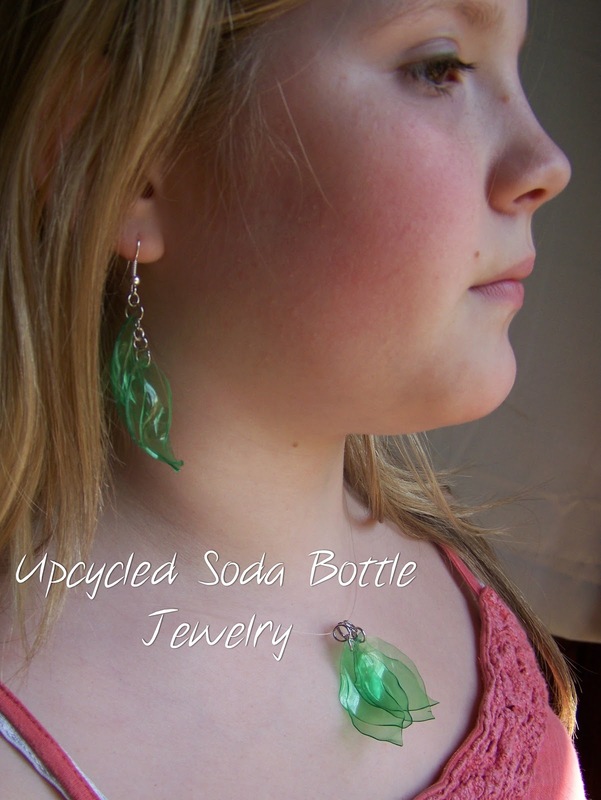 Poppy Juice: Go Green Just In Time For St. Patrick's Day - Upcycled Soda Bottle Jewelry! Go Green Just In Time For St. Patrick's Day - Upcycled Soda Bottle Jewelry! Even though we've been making a concentrated effort on wasting less and using more of what we purchase, I've noticed there are still far too many plastic bottles that come through our home. Our trash service doesn't offer curbside pickup of our recycling and sometimes it is months before we drop off our recycling. 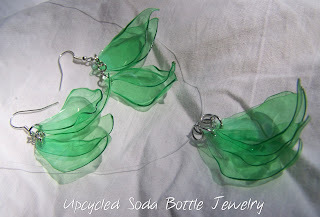 I reuse bottles as much as possible, but I wanted to take things to the next level! So in the spirit of St. Patrick's Day, I decided to really "go green"! of the feather with scissors. decided how I wanted to create the look. chain but you could use an actual chain. This photo shows the detail better. For this project, I used a 2 liter soda bottle, fishhook earring bases, coupling links, and fishing wire from my husband's tackle box. I did borrow his needle nosed pliers as well. 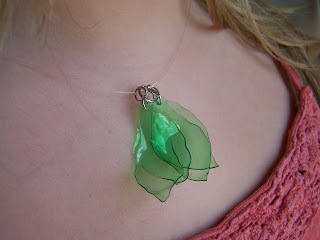 I'll probably invest in some jewelry making tools and supplies as I think it will make future projects easier. If you liked this article, don't forget to subscribe! It's easy, just click the link on the right side of this page to receive all the future cool ideas from Poppy's Money Tree House! WOW I don't wear earrings but the idea is super cool! They look fab too! Thank you tribalmama! I just love finding ways to recycle! And a wonderful imagination, too. Your jewelry looks great! Linda, Thank you for your vote of confidence! I had such a good time making it! 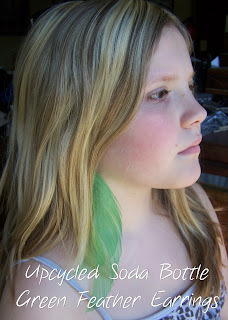 wow who knew soda bottles could be so cute! 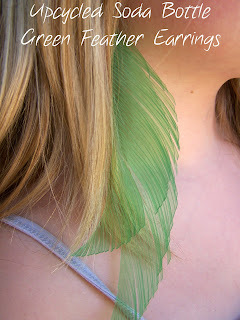 I just got my ears pierced in January (along with my 8 year old daughter), this could be a fun project for us! That's the spirit! It really is so much fun to be creative AND recycle at the same time. Thanks for stopping by Tammy! Be sure to take photos of your creations and post them! Very nice! I really like them and will have to try this myself. Thanks Becky! They really were super easy to make! I do hope you'll post some photos of your creations! How cool are those! Very creative my friend! Wish I had parts around. :-) would have to buy a soda. LOL and the jewelry parts. Might just have too. It really is fun! I just wish there were more colors than clear and green with soda bottles. There aren't any other colors, right? Yes!!!! Rootbeer bottles are brown sometimes, aren't they! Poppy, you did a wonderful job! I love everything! Marina, Thank you so much your kind words! I really appreciate your visits! Thank you Sandie! I hope you had a wonderful St. Patrick's Day! We stayed busy all weekend and I'm just now getting back to my computer today. As always, I sure appreciate your visits! Those are awesome! I love the colour, too. You're incredibly creative. Thank you Carolynn! I very much appreciate your positive feedback on this one. 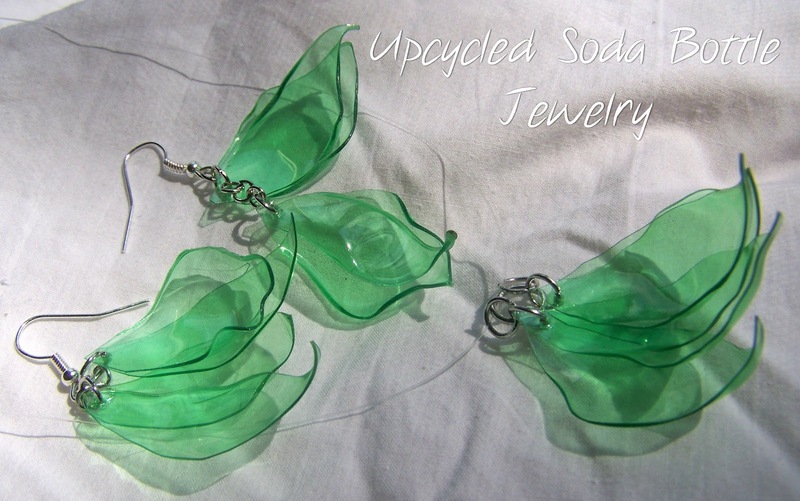 I've been busy lately creating other pieces of jewelry with soda bottles and am just loving the process. 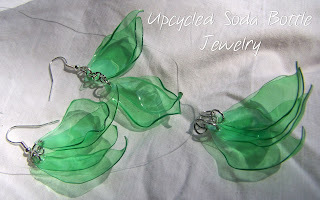 I am going to try this, I am 84 yrs old but still crafting,and I saw a lite where you make the jewelry out of a pop bottle but you put them in the oven to curl and I saw one where you use the lid to draw circls and cut them out and I can't find any of those sites now. and did so want to make them. if anyone knows the site and wants to help me I am at 4lilymae4@gmail.com, I like to keep my hands busy. and love crafts. I love your earrings! I love to upcycle household items! Right now I am using old glass and everyday hardware items. check out my website at www.zibbet.com\masalajewel. Thanks for sharing your great idea!